The Attestation form completed in 1915 by Arthur William Ogden of Belvoir Avenue, Bottesford. Arthur Ogden of Bottesford service record giving his family and honours. 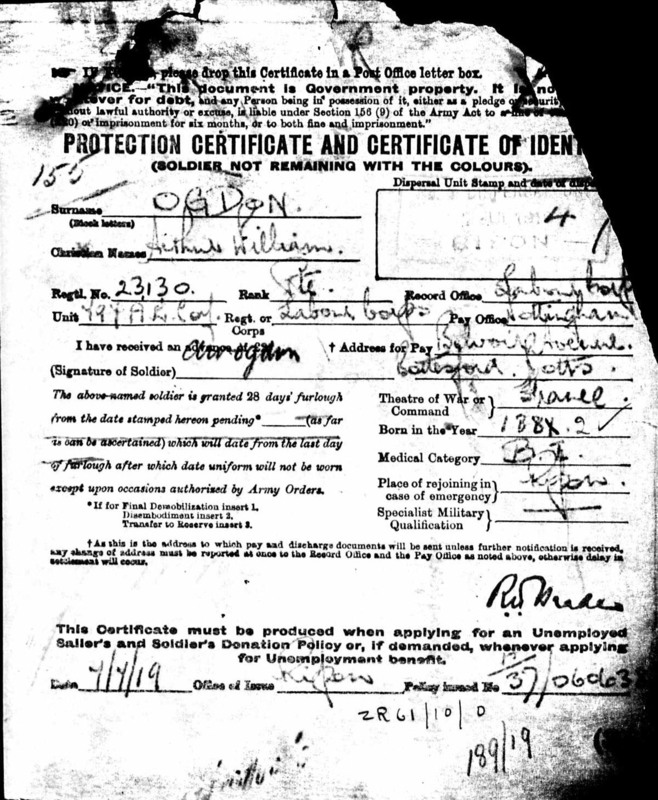 Arthur William Ogden was named as an Absent Voter in 1918/19, his home address given as Belvoir Road, his Service Number as Private 23130, 720th Company, Labour Corps. 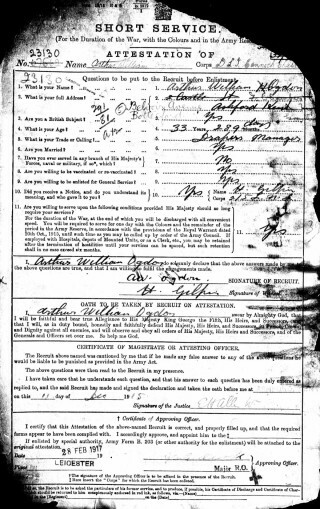 Arthur William Ogden was born in 1844, assuming the information in his Military Records is correct. He may have come from Burnley, Lancashire, but this is uncertain. What we can be sure of is that he married 23 year old Florence Brooks on the 17th May 1905 at All Saints, Loughborough. Her father was William Brooks of Fairfield, Buxton. 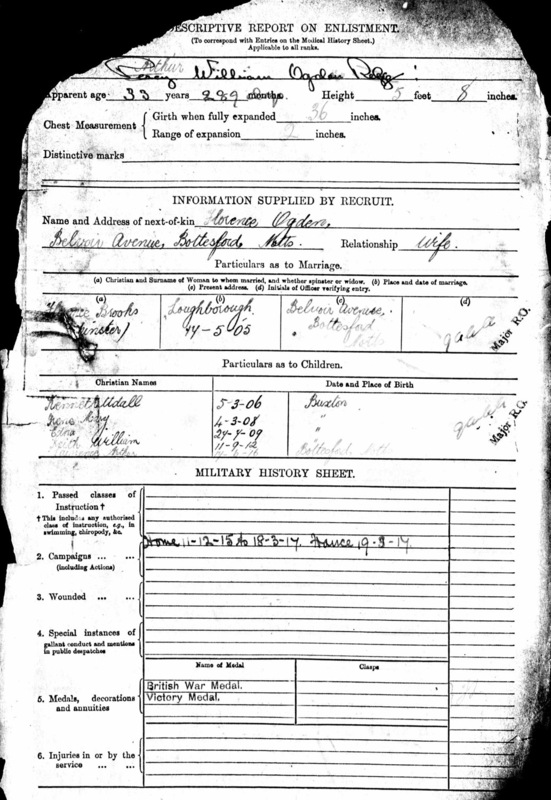 Information in his Military Records (see below) confirms that they went on to have four children, Kenneth Udall (born 5/3/1906), Irene Mary (b.4/03/08), Edna (b.27/07/09) and Keith William (b.11/09/12), while living in Buxton, and one more named Lawrence Arthur (b.17/06/16) in Bottesford. Evidently, they went to live near or with Florence’s father after they married, then moved to Bottesford between 1912 and 1915. It not clear why they married in Loughborough (nor why they later moved to Bottesford). In Bottesford, they lived on Belvoir Avenue, where their fifth child was born in June 1916, six months after he enlisted. He then remained in the army as a reservist until the spring of 1917, though the reason for this is unclear. Arthur William Ogden joined the army on the 11th December, 1915, aged 33, describing himself as a ‘draper’s manager’ whose address was 5 Belvoir Avenue, Bottesford. He was initially enlisted as Private 67562, posted to the Durham Light Infantry at Cannock. However, his Service Number was changed to 23130 when he was posted to army reserve on the 12th December, 1915, and remained in England until the 18th March, 1917. He was finally mobilised on the 28th February, 1917, and transferred to the 39th Labour Corps, arriving in France on the 19th March, 1917. 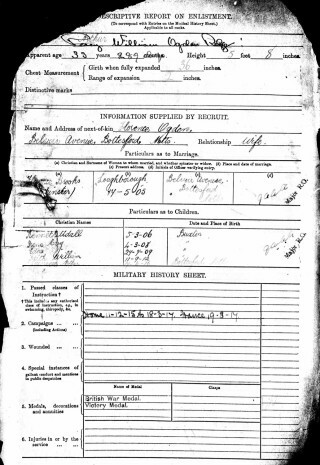 He received another posting on the 15th August, 1917, though we do not have details save that his Protection and Identification Certificate records that he was part of the 797 A.E.Coy, Labour Corps. He was appointed an unpaid a/Cpl (acting Corporal) on the 17th March, 1919, but reverted to Private on the 13th June, 1919, before being discharged from the forces. His Pension included 30% disablement money reckoned from the 5th August, 1919 and a further 15s for 33 weeks (subject to review). He was, perhaps somewhat belatedly, awarded the British War Medal and Victory Medal in 1921. THE LABOUR CORPS Formed in February 1917, is generally regarded as a predecessor of the Royal Pioneer Corps. In WW1 the British had no organised Labour system at the start of the war, depending on civilians supplied by the French Government. As the war progressed demands for Labour increased as armies grew in size and at the same time less Frenchmen available to assist. The British started to send labourers to France in 1915-1916 to work in docks etc. In April 1917 they were formed into a Labour Corps which was to reach 325,000 British soldiers, 98,000 Chinese, 10,000 Africans, 6 Battalions British West Indies Regt, 300,000 PWs and contingents from Egypt and Fiji all serving in France in Nov 1918. They also included non-combatant Coys and Alien Coys. Among its ranks were a number of labour units, originally formed as Battalions of Infantry Regiments. These were of two types, Works Battalions and Labour Battalions. 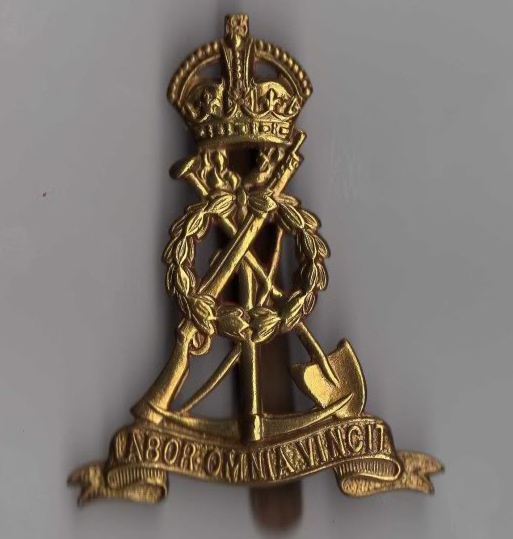 When these were transferred from the infantry to the Labour Corps in the middle of 1917, the Works Battalions were (rather confusingly) re-designated Labour Battalions, while the original Labour Battalions were broken up and reformed as Independent Labour Companies. 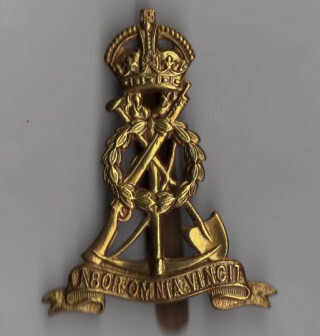 The initial need for labour units during WW1 had been achieved with some 38 Labour Battalions established in 18 different infantry regiments, and a large number of Labour Companies from other infantry regiments. In addition there were a good number of Labour Companies in the Royal Engineers and the Army Service Corps. All these became Labour Corps companies in the spring and summer of 1917. The Labour Battalions and later the Labour Companies of the Labour Corps carried out a whole range of defence works duties in the UK and in overseas theatres, especially in France and Flanders. These included road and railway building/repair, moving ammunition and stores, load and unloading ships and trains, burial duties and at home agriculture and forestry. Lists of Bottesford electors from the 1920s record that Arthur William and Florence Ogden continued to live in Bottesford, on Belvoir Road, at least until 1926. Interestingly, the Grantham Journal of the 6th October, 1923, carried a report from the Belvoir Petty Court Session: “Ejection Application. – Joseph R. Cutforth, Albert Street, Bottesford, applied for an ejectment warrant against Arthur W. Ogden, in respect of a house occupied by him on Belvoir Road, Bottesford. Applicant said Ogden was a weekly tenant at 4s 6d per week, but it was paid monthly. He gave Ogden a month’s notice to quit in August. Witness became the owner of the house in June 1920, and required it for his own occupation, there being insufficient accommodation in the house where he was living. He was a married man, but had no children at home. An order for possession after expiration of 28 days was granted.” The outcome of this has not been found. As yet, we have no certain information about their later years, or of when or where Arthur and Florence died. In investigating the service history of Arthur William Ogden of Bottesford, we acknowledge that he has previously been confused with Arthur William Ogden of Belvoir who served in the army in Burma where he became a civil servant. Notes regarding the career of this latter soldier have been added to the account of his brother Bernard’s career in the website.